My visit on Thursday evening to the Black Lab Bistro in Phoenixville, PA was a spur of the moment decision. I had an early Friday morning meeting at work and my friend Gerry B. suggested I stay over at his house for the evening. Once that was agreed to, it was pretty much a given that we would be heading out somewhere to drink some good wine and have a nice meal. 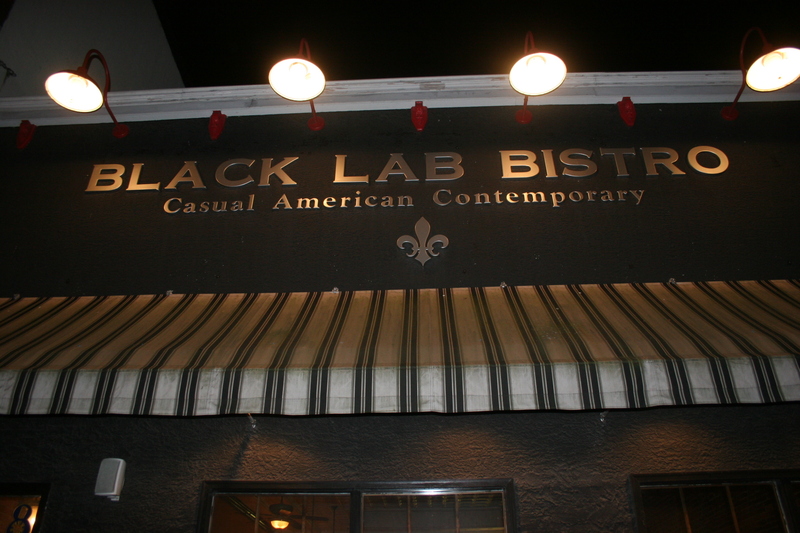 The Black Lab Bistro is located on Bridge Street in the heart of a rebuilt, and now bustling, Phoenixville, PA. In some respects the town reminds me of Collingswood, NJ. It was busy on a Thursday evening and Gerry reports it’s teeming with young people on the weekends. Inside this restaurant the walls are a cheery yellow and seating is ample allowing for some semblance of privacy. The menu is extensive and in addition they had a large number of daily specials that were just as enticing as the regular fare. 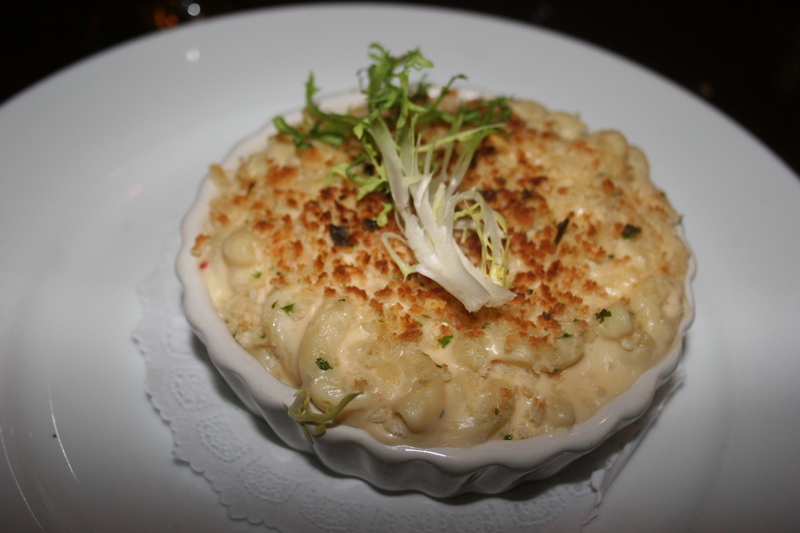 I knew from the beginning I would not be able to resist trying the Lobster Mac n Cheese appetizer. Let’s just say I would have been content with a slightly larger portion to serve as an entree and I would have been well fed for the evening. This dish was perfect. A crispy top with wonderful cheese and lobster with truffles, creating a near-perfect start to the meal. It was going to be hard for any entree to surpass this. While I was salivating over my choice Gerry was enjoying his Seafood Sausage in a whole grain mustard crème. This appetizer was eerily familiar to the Shrimp and Crab Boudin that I had at Karen & Rei’s just two weeks ago and found to be less than spectacular. My fears were totally misplaced as this item turned out to be wonderful. 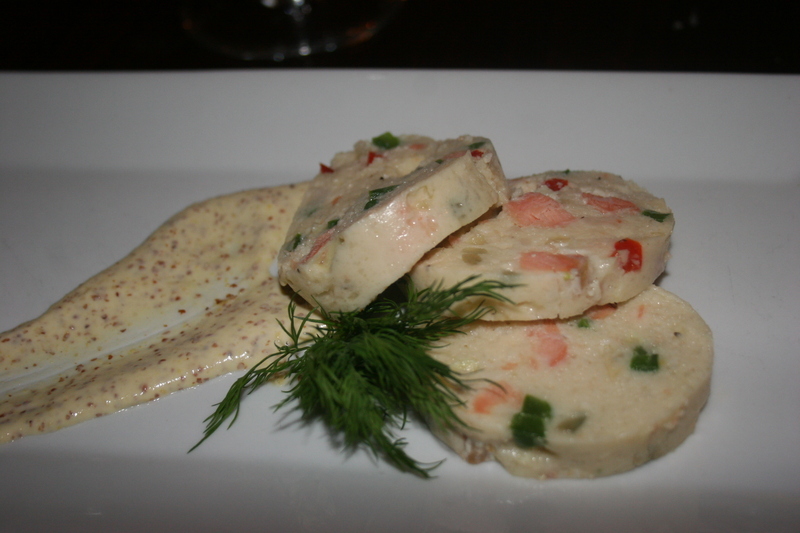 It had a pate-like quality and the colorful red and green peppers interspersed gave it a nice taste and the mustard crème accentuated everything. This is how you do Seafood Sausage! As we enjoyed our starters we drank both our wine choices that Gerry had generously provided for the evening. 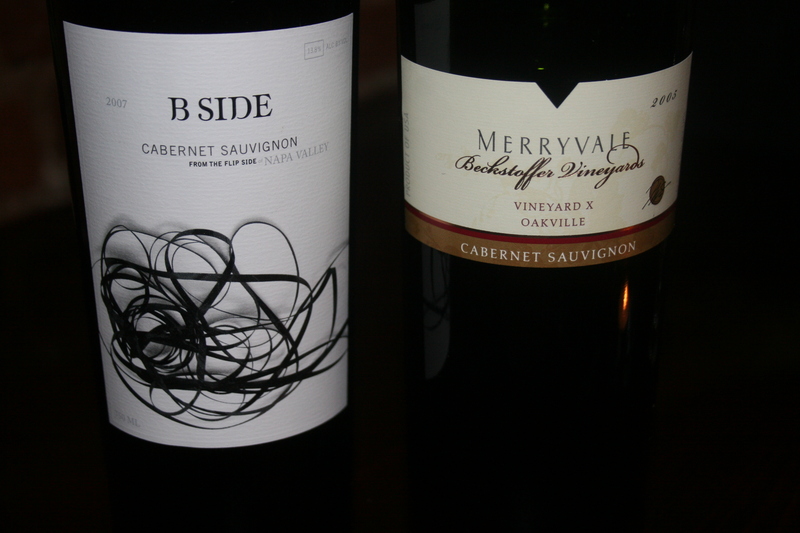 The 2007 B Side, Napa Valley, Cabernet and the 2005 Merryvale, Beckstoffer Vineyards, Vineyard X Oakville, Cabernet. The Merryvale is a current Chairman’s Selection in the PA State Stores while the B Side was a recent purchase he made on a visit to Hops n Grapes down in my neck of the woods in NJ. Both these wines were elegant with great bouquets and lots of cab fruits. We both gave a slight edge to the B Side, it had a slightly unique texture and perhaps we weren’t expecting nearly as much from the B Side as we were from a wine where the grapes grew in the rich soil of the Beckstoffer Vineyard. It’s always nice to be totally surprised with a wine and it’s what makes tasting different wines such an enjoyable experience. 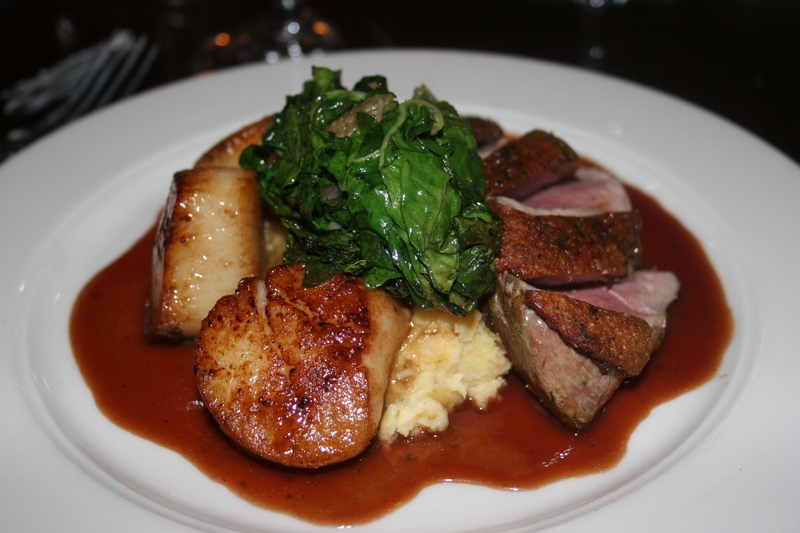 The duck was nicely done and the sauce flavorful. The scallops were damn near perfect; light, tasty and the black currant sauce was made for both. Gerry had his eyes glued to the Specials of the Day and couldn’t wander away from the “Black Angus Filet, “Oscar”, lump crab meat, asparagus and whipped potato. 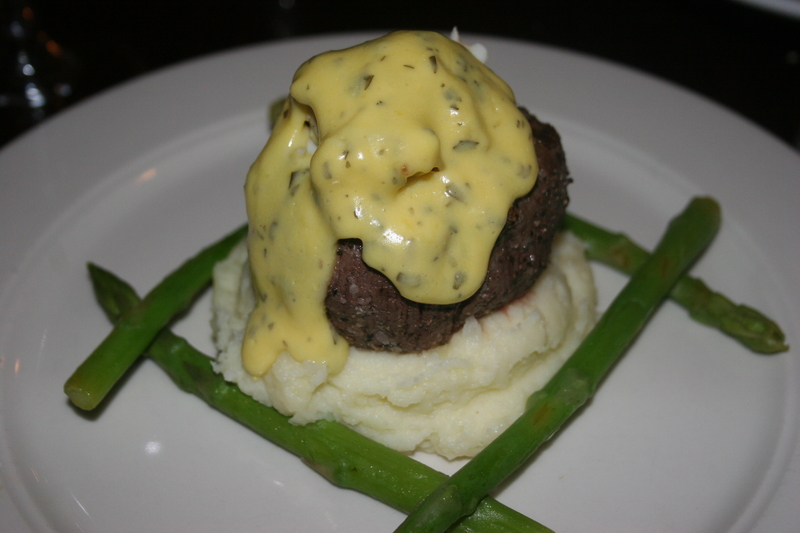 There was not a whole lot to not like about this entree as the tender filet was piled high on the mound of creamy potatoes and garnished nicely with the criss-crossed greens. Both of the wines proved excellent additions to the hearty steak and our conversation took a back seat to enjoying this gourmet feast. In addition to everything tasting great at the Black Lab, I would also mention that the food presentation here is top-notch. I’m getting hungry all over again just looking at these pictures. But, as they say in the ginzu knives commercial, “but wait, there’s MORE”! You haven’t seen the desserts, yet. 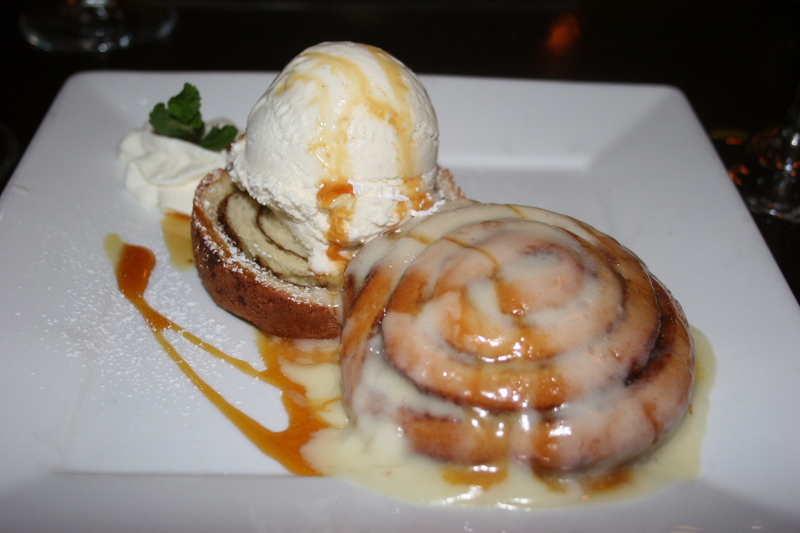 Say hello to my little friend, the Cinnamon Bun Ice Cream Sandwich. If I had any sense I would have passed on dessert as the duck, scallops and lobster mac n cheese should have been enough to feed a small army. Trust me, you would give in to this dessert menu just like I did. I’m not even going to tell you how good it was. Look at it again and see if you can guess. I would strongly suggest that even if you can’t get over to the Black Lab Bistro in Phoenixville, that you click on the link I have provided to their website and go thru the menu. It will almost be like dining there without the best part of actually eating the food. Enjoy, I did!